Approximately 6 weeks ago while I was in the midst of completing the purchase of the Clint 2 pistol, I received an E-mail from Walter Sanford with the attached grouping of pictures. Subsequently Walter and I talked about what the components in the pictures were and what place they may have had or not had in history of the Auto Mag if any. Walter was not sure as to the significance of the pieces and was not sure whether they were even attached to the advent of the Auto Mag. It was evident to me that some of the components, especially the bolt configurations, could be related to Auto Mag experimentation. Walter offered to sell the components to me with some other related pieces however, I decided to facilitate the sale of these pieces to another collector with the understanding that I could publicize the components for all to enjoy with input from Max Gera and an article produced by someone I considered an expert on the history of the Auto Mag, Bruce Stark. I thought the timing could not be any better than now with Bruce’ efforts to reconnect Max to the Auto Mag world and the selling of Auto Mag historical treasures by Walter all coming together at the same time. The following are Mr. Stark’s observations along with Max Gera’ input on the components Walter offered to me. Photographs by Walt Sanford. 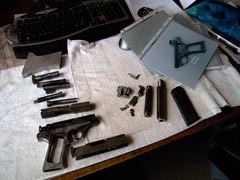 Recently Walt Sanford discovered this accumulation of parts in the back of his safe. One wonders how many other discoveries there will be in the future. Walt believes some of these parts may be pre-prototype parts made for conceptual discussion and experiments, but for what gun ? Before these parts get buried into someone’s collection these photographs are offered for review along with a brief discussion of each part. I spoke with Max Gera the evening of 23 August 2009 to ask him what he knew of these parts and particularly the frame and slides. Max gets excited every time some of his old work resurfaces. Old memories kick in and he gave me a full rundown on these parts. Max took me through the progression of his experiments as best as he could remember. His first idea was the P-38 design where he took two P-38 frames, cut them in half and re-welded them back together into one frame and created a crude slide for it. This frame was pictured for a while on one of the many Auto Mag web sites. Max then experimented with a rotating bolt design. Max’s second idea was to place the rotating bolt into a frame with an internal spring instead of the P-38 side placed springs. He believes he made at least two of these frames and a few slides. Because there was no room for the spring to compress Max abandoned this design. The frame and slide at the bottom of the picture is the second of the two prototypes Max built using this design. The slide below it is the slide made for the first attempt of this design. The rough cut “frame” at the top of the picture is not something Max has ever seen before. It would be nice to see if it has the magazine hole cut through it. 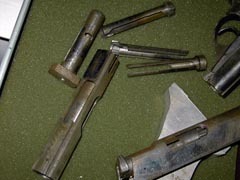 Below the “frame” are two bolt carriers and two bolts that were experiments for this design. The parts on the right side are a different story. 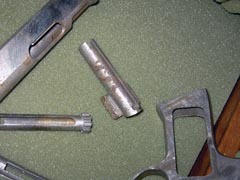 The cocking piece on the right is a production cocking piece, note the flares. It may be un-machined or the aluminum master used to produce the molds used to cast the production cocking pieces but with no description from Walt, it is hard to tell. 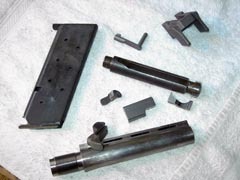 Below the cocking piece is a piece that was welded to the bottoms of the XP barrel extensions that has the straight cut design, similar to the P-38, that was later changed to the dove-tail design. This is from the Barbasiewicz time period and is not from the Max Gera era as Max did NO welding on the gun. The magazine is from the era of the Lovendale design team. It would have been used on the #2 or #3 guns seen in the POWER Brochure and multiple advertisements. Note the 1911 style hold-open design which was later abandoned. It would be nice to see the reverse side as a factory directive dictated that all XP magazines have the follower pin slot cut into the magazine. Max says that the threaded barrel and the threaded bolt were made by Gross Instruments. To continue with the history, Max went back to the side mounted recoil springs and perfected his double camming bolt. He then built the first working Auto Mag. Max says when he originally built it it had no rib. Max says he may have installed a Gross Instruments barrel onto this gun as one of the last things he did on the gun. Max (with help) then produced a set of drawings that were sent to Gross Instruments. The first gun Gross Instruments made wouldn’t cycle so Max added the accelerator and bolt rotation spring just to get the gun to cycle for the rocket scientists now taking over the engineering of the gun. Back to the parts, the hold open is one that Max made to be used with this design. The accelerator block is for the #2 and #3 guns and the accelerator is unfinished and it appears to be for either a Max gun or the #2 or #3 gun. The hammer could be for anything. The picture doesn’t show enough to make an evaluation. Gross Instruments went on to make a few more prototypes before the Lovendale design took on the project in late 1970. So here we have Max Gera’s second attempt at a rotating bolt designed Auto Mag with some extra prototype parts. A Gross Instruments Barrel and bolt. 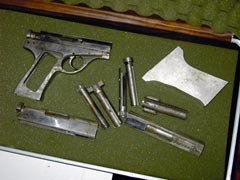 A Lovendale era magazine, accelerator and block, a Barbasiewicz barrel extension slide piece and a production cocking piece. Also a rough cut of a frame and an unknown hammer. There was a rumor in 1977 that Ed O’Neil would tell about how Bob Barbasiewicz had redesigned the Auto Mag and had given or sold the design to Harry. I would like to see this gun resurface too.